One in three employees admits they have been to work with a hangover and more than one in 10 has been drunk at their desk, a study suggests. Staff said they made mistakes, struggled to concentrate and had to go home early as a result of drinking. Four out of five employers say alcohol is the biggest threat to the well-being of their staff, according to a survey for Norwich Union Healthcare. Alcohol Concern said bosses needed to be aware of symptoms of alcohol abuse. One thousand people and 250 businesses were interviewed about drinking habits for the survey. Of those who had had a hangover or been drunk at work, 85% confirmed it affected their performance or mood. More than a third (36%) found it hard to concentrate, 35% were less productive, 42% felt tired to the point of being sleepy and 25% did the minimum amount of work and went home as soon as possible. The number who admitted to have been drunk at work was also high in the construction industry (24%), professional and business services (23%), and information technology (15%). 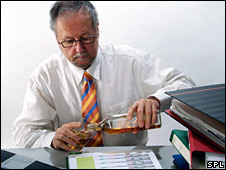 Don Shenker, from Alcohol Concern, said that with so many people drinking at harmful levels, it was not surprising that it was having an effect on the workplace. "After-work or lunchtime drinks are the norm for many and in some cases this is promoted by companies as a way to build teams or just as the way to do business." Mr Shenker said employers needed to watch out for the early warning signs that alcohol may be affecting their workers in a serious way. Cary Cooper, Professor of Organisational Psychology and Health at Lancaster University, said excessive drinking was a manifestation of stress, and it was endemic in certain industries. "It's no surprise there is a lot of drinking in the media; it's part of the culture to unwind with a drink. "This is not about social drinking. This is about the long-hours culture we have in this country. "It's the jobs where there is most stress - long hours, high expectations, short-term contracts and bad management - where you get the most excessive drinking." Professor Cooper said people drank to cope with stress. "Employers need to change the culture of long hours. More flexible working is needed and employers need to offer more healthy options such as more working from home.